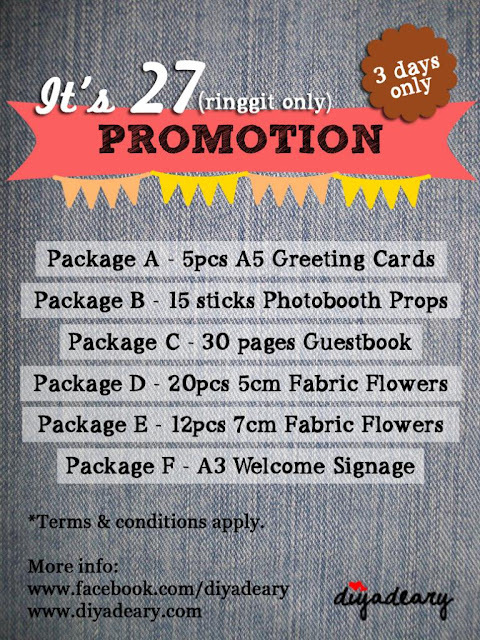 And in conjunction with it, she would love to celebrate her birthday with everyone by organizing this "It's 27 (ringgit only)" promotion! It means every single package offered is worth 27 ringgit only. There are 6 packages for you to choose and, you can purchase as many packages as you want! Yes, you hear it, people! It's a steal! - 5 pieces A5 half fold greeting card. - Theme and colour can be customized i.e. birthday, hello, love, thank you etcetera. - 15 pieces of photobooth props stick. - Font and colour design is as it is. - Wording: Just married, Single, Taken, Congrats, Engaged, Love is Sweet, I ♥ you, Wifey, Hubby. - Shape: Moustache (2 pieces), Bride spec, Groom spec, heart, lips. - A metal comb binding guestbook with 30 pages. - Guestbook colour theme and pages layout design can be customized. - Pages layout to be in black and white prints. - for D: 20 pieces fabric flower with pin (approximate diameter 5cm). - for E: 12 pieces fabric flower with pin (approximate diameter 7cm). - Colour can be chosen from our fabric collection. - An A3 welcome signage. - Hard cardboard use as signage’s base. - Colour theme can be customized. 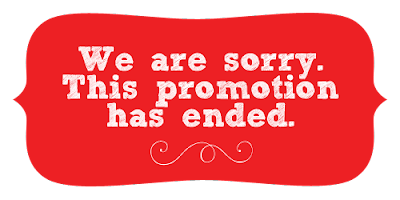 And here are the terms and conditions for the promotions! - Each package price is RM27. - Unlimited package purchase per customer. - Package to be use in November 2013 and onwards. - Price is exclusive shipping and handling cost. - Full payment must be made by 13/9/2013 to confirm your order. - Non refundable for any cancellation. - Diyadeary has the right to the alter terms and conditions at any time without any warning. This promotion will last for three days until 12th September 2013! So, grab it NOW before it's GONE. Have fun!